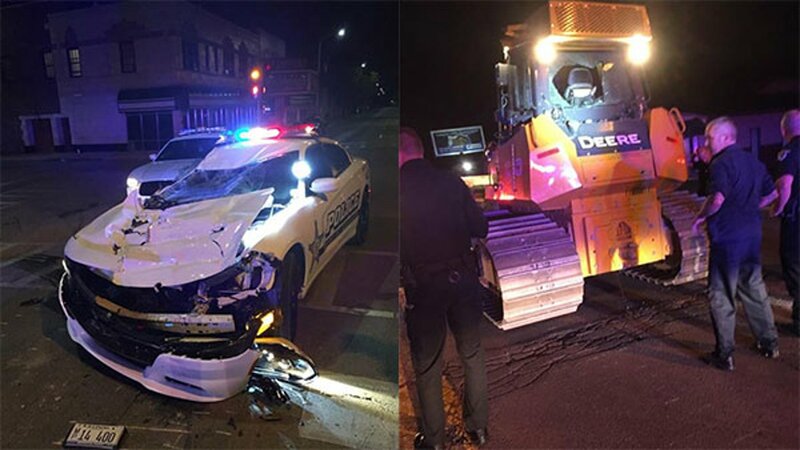 KANKAKEE, Ill. (WLS) -- A Bourbonnais man stole a bulldozer in far south suburban Kankakee and drove it around the streets, backing over a squad car when officers tried to stop him, police said. Police said they received a call at about 3:15 a.m. from an off-duty police officer saying a John Deere bulldozer was spinning around in the street near the intersection of North Schuyler Avenue and East Mulberry Street. When officers responded, the bulldozer was driving south on Schuyler. An officer attempted to stop the bulldozer, but the driver put it in reverse and backed over the front of the officer's squad car. No one was injured, but the car was heavily damaged. Police then followed the bulldozer down Schuyler for 12 more blocks before a cab window was broken and officers subdued the driver with a Taser. The driver was identified as Austin White, 18, of Bourbonnais. He was taken into custody and then to St. Mary's Hospital to be treated for injuries. The bulldozer was stolen from a construction site in Bradley, Ill., and driven for four and a half miles before White was stopped, police said. Charges are pending.